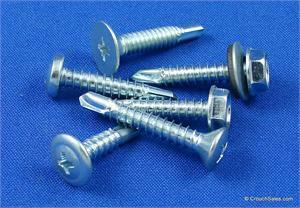 Self Drilling Screws are also known as Tek Screws. Tek Screws are self drilling sheet metal screws or teks with a drill point tip or self tapping tip at the end of the screw. Tek Screws are similar to sheet metal screws but with a drill bit type of tip or point that can self drill a pilot hole. Tek Screws in Zinc Plated are available in several head styles, drives and self drilling points including teks with phillips flat head, hex head, hex head bonded seal, phillips round washer head, phillips oval head, phillips pan head, phillips wafer head, phillips flat head plymetal reamer, and hex head tek 5. Self Drilling Tek Screws are also available in Stainless Steel. Phillips Flat Head Tek Screws Zinc Plated a/k/a Phillips Flat Head Teks are self-drilling sheet metal screws with a drill point self tapping tip at the end of the screw and threaded above the tip to the countersunk head. Hex Washer head bonding sealing tek screws a/k/a Hex Teks with Bonded Seal are zinc plated self-drilling sheet metal screws with a drill point or self-tapping tip at the end of the screw and threaded from the tip to the head with a bonded sealing washer. Phillips Modified Truss tek screws a/k/a Phillips Round Washer Head teks are zinc plated self-drilling sheet metal screws with a drill point tip or self-tapping tip and threaded to the round washer head. Phillips Oval Head Tek Screws Zinc Plated a/k/a Phillips Oval Head Teks are self-drilling sheet metal screws with a drill point self-tapping tip at the end of the screw and threaded above the tip to the countersunk oval head. Phillips Pan Head Tek Screws Zinc Plated a/k/a Phillips Pan Head Teks are self-drilling sheet metal screws with a drill point self-tapping tip at the end of the screw and threaded above the tip to the pan head. Phillips Wafer Head Tek Screws Zinc Plated a/k/a Phillips Wafer Head Teks are self-drilling sheet metal screws with a drill point self-tapping tip at the end of the screw and threaded above the tip to countersunk extra large round head. Phillips Flat Head Plymetal Reamer Teks with Wings a/k/a Plymetal Teks are zinc plated self drilling sheet metal screws with an extra long drill point tip with wings on the tip commonly used to fasten metal to wood to metal with no pre-drilling.